Event tomorrow at the Games Developer Conference. 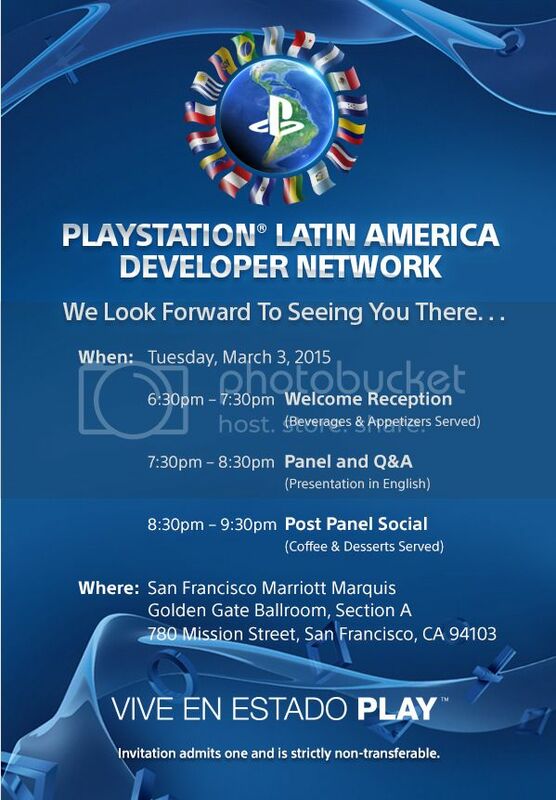 For those of you who will be in San Francisco tomorrow for the Games Developer Conference, Playstation has announced an event they are hosting as part of their Latin America Developers Network. The event sounds incredible as it promises presentations from successful developers with a question and answer segment afterwards. You can follow this link to RSVP and check out the description below. The PLAYSTATION LATIN AMERICA DEVELOPER NETWORK, an invitation only event, will feature a 45 minute presentation from four successful Hispanic game developers, including Hector Sanchez from Santa Monica Studios and Luis Villegas from Bungie, as they discuss their industry experience and how their Hispanic heritage has enriched their work. Topics will range from career paths for students and aspiring developers to how thinking from a cultural perspective can bring new ideas to a game and how their Hispanic culture has contributed to their work. Following the presentation, there will be a Q&A session where media, indie developers and students alike can dive deeper into these topics. Afterwards, there will a social reception where attendees can approach the panelists one-on-one for follow up questions.